Fantastic sea view, modern decorated aparatment placed closed to many bars and restaurants and amazing cliffs on sea side. The view is amazing, the property cannot have any other name! Waking up, opening your eyes and seeing the cliffs is priceless! The apartment is super cozy, we felt at home and it was hard to leave. For sure we will come back again... and again! Position is great in the center of the town and the accommodation offer a free private parking. Best location, 2 rooms in apartment, both sea view. In apartments there is everything for comfort, very good small kitchen. Everything is very clean. The big bonus was not just an amazing internationally famous sea view but close proximity to the sea too. The overnight 50+mph gusts made us appreciate the roll-down shutters however! We had a very warm (non english speaking) welcome & private off-street parking. The living room & bedroom were spacious & bright with big sea-view windows. A dishwasher was an unexpected bonus. Vue exceptionnelle, logement très bien aménagé et très agréable. Très lumineux. Proximité immédiate de la plage . La place de parking dans la cour est un vrai plus car il est très compliqué de se garer dans le centre . Prachtig uitzicht! Het onthaal was super en zeer vriendelijke host die haar tijd neemt om het appartement te laten zien. Het appartement bevat veel comfort. We hebben al veel appartement en geboekt maar dit is meer san een 10 op 10 waard. L'emplacement de l'appartement qui donnais vu sur les falaises. La propreté du logement, l'accueil, et le confort du lit. La situation géographique est incroyable !! Nous avons eu une météo sublime, ce qui rendait le tout encore plus agréable. Claudine est un amour, très gentille et accueillante, elle nous a conseillé pour le choix des restaurants et c’était un succès ! L’appartement est décoré avec goût, on s’y sent bien ! Le lit de la chambre double est très confortable et quand on ouvre les volets le matin, et qu’on voit la mer et les falaises, la magie opère ! Nous reviendrons ! 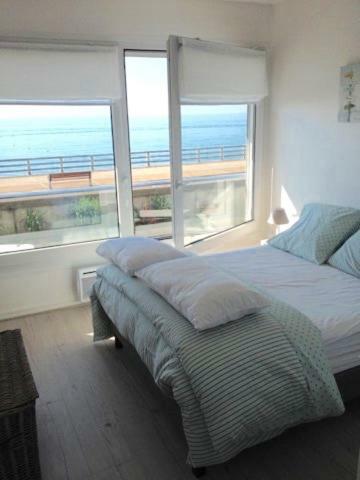 Lock in a great price for Sea View – rated 9.2 by recent guests! One of our best sellers in Étretat! Featuring a casino, Sea View provides accommodations in Étretat with free WiFi and sea views. This apartment also features a restaurant. The 1-bedroom apartment has a living room with flat-screen TV, and a fully equipped kitchen. The apartment also has a bathroom with a shower. Etretat Beach is a 2-minute walk from the apartment, while Etretat's Cliff is 2,100 feet from the property. The nearest airport is Saint-Gatien Airport, 51 miles from the property. This property also has one of the top-rated locations in Étretat! Guests are happier about it compared to other properties in the area. This property is also rated for the best value in Étretat! Guests are getting more for their money when compared to other properties in this city. Toilet & kitchen a little cramped. No washing machine which could be a disadvantage for a longer stay than our four nights. The sofa was not the most comfortable. The location, the interior design, the view.